After writing about my poker setup for my UK PokerNews column about a year ago (see here), I felt I had improved things a sufficient amount over the last year to write another piece on the same subject (nothing to do with struggling for a topic then) which is available by clicking the link below. Here's a couple of screenshots to show the evolution of my poker setup over the last year, and the video I made for PokerNews giving a little tour of my office. 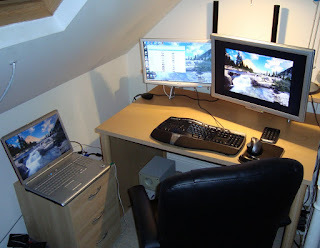 A majority of these pictures were compiled from the 2+2 thread "Most baller set up". 1 Comment to "Sick Poker Setups"